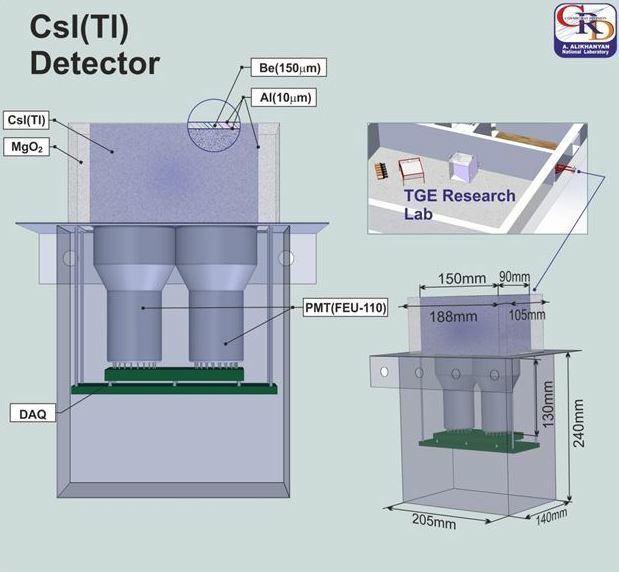 Figure 1: The construction of CsI(Tl) detector. PMTs and electronics housing box. Both boxes are removable and are attached with the platform by waterproof and light-tight gaskets. Two PMT (FEU-110 type) are directly attached to the bottom surfaces of the CsI(Tl) crystal. Dimensions of the crystal are 9x9x15cm3. As we can see in Fig.1 the upper side of crystal is covered with Beryllium plate of 150 μm thickness oand aluminum foil-10 μm thickness (the window size - 9x15cm2). The total amount of window thickness is 36mg/cm2, that provides ~98% transparency for gamma- photons with energy greater than 50 keV. In order to shield the detector from natural low-energy environmental radiation lead slabs surround four sides of crystal box with 14 mm thickness. Signals from PMTs are sent to the DAQ system consisting of two channel amplifiers, discriminators, shapers and block of coincidence. Coincidence signal from 2 PMTs opens the gate, which transmits PMT signals to the logarithmic amplitude analyzer (LADC).